What an ingenious idea - animated cards that you can create over and over again, thanks to Stampin' Up! 's design team. Tuesday 29th August 7-9pm (Brackley). 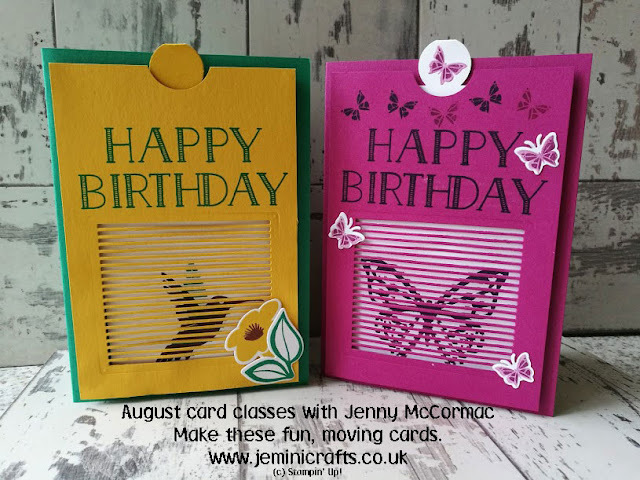 As you lift the circular tab at the top of each card, the wings appear to move and give the impression that the butterfly and hummingbird are in flight. To see that in more detail, pop over to my You Tube video link. I do currently have a few spaces left at all 3 classes, so if you would like to join us, just email me by return and I'll try and fit you in if there is still space. These are really easy to make - and are suitable for beginners as well as experienced crafters. Hope you can join me at a class really soon.